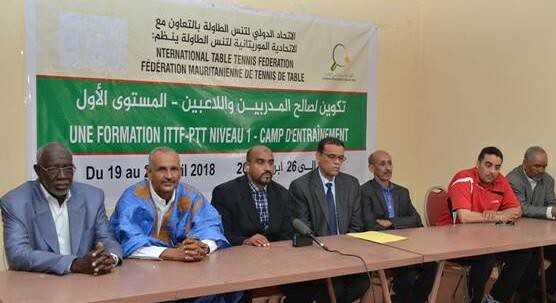 Bordering the Sahara Desert, located in North West Africa, Mauritania was the home for a recent ITTF/PTT Level One Coaches Course; the destination for the students was the capital city of Nouakchott. Proceedings commenced on Thursday 19th April and concluded on Thursday 26th April; the expert on duty was Ramzi Mabrouk, the Africa Development Manager. It was the first time since the creation of the Mauritanian Table Tennis Federation in 1973 that an ITTF Coaches Course had been organised in the country. Notably, it is only in the last few months that table tennis has begun to resurface in Mauritania. Notably, most of participants were government officials, inspectors and managers who worked in the Ministry of Youth and Sports of Mauritania. It would appear for Mauritania the situation is that new blood is needed. Positive words from Ramzi Mabrouk and no doubt justified; a new dawn surely awaits in Mauritania.